Health At Every Size is written by Linda Bacon, Ph.D., a researcher, clinical psychotherapist, exercise physiologist, health educator and associate nutritionist at the University of California. Bacon asserts that this is not a diet or weight loss program but instead is a book about healthy living. She aims to provide you with a plan that will help you feel great in your body right now, no matter what size you are. According to Health At Every Size the problem isn’t fat, it’s dieting, and a medical establishment that associates being thin with being healthy. She says that in actuality overweight people live longer than normal weight people on average, so our goal shouldn’t be just to lose weight but rather to improve our general health. The book begins by discussing some of the myths related to dieting and weight management and outlines how the weight loss industry manipulates statistical data to create a false relationship between body weight and potential health concerns. She also explains how we can actually cause many more health problems by attempting to achieve a “perfect” weight than by accepting our current size and simply trying to be as healthy as possible. Bacon says the latter approach has been scientifically proven to boost self-esteem as well as to enhance general well being. You are encouraged to listen to your body for guidance, eating the foods you enjoy and those that help you feel good. The book doesn’t include a meal plan or lists of acceptable foods but dieters are encouraged to emphasize the intake of whole plant foods that are high in fiber. But you don’t have to eat these foods exclusively and have permission to enjoy any food you like on this plan. According to Health At Every Size, burgers and donuts are fine, so long as they are consumed in moderation in the context of an overall nutritious diet. On the other hand you shouldn’t eat if you are not feeling hungry and always stop eating when you feel satisfied. Overeating should be avoided, while enjoyment of meals is encouraged. Fruit, vegetables, whole grain bread, brown rice, oatmeal, beans, nuts, seeds, avocado, salmon, tuna, chocolate. This healthy living diet does not include a meal plan. Regular physical activity is encouraged because it triggers changes in the hormones and neurotransmitters involved in health and weight regulation. But it is not necessary to join a gym or do exhausting workouts to get results. Fitness can be improved by daily activities – such as housework and gardening – with results that are just as beneficial, or even more so, than strenuous aerobic exercise for some people. Wherever you can, find ways to integrate more movement into your daily life. As you become more active and find yourself getting stronger you may consider trying activities such as hiking, cycling, tennis, dancing, swimming or horseback riding. 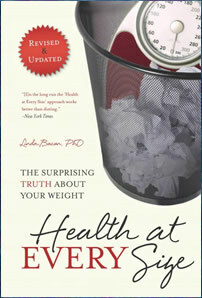 Health At Every Size: The Surprising Truth About Your Weight retails at $14.95. Click Here to purchase a discounted copy of Heath at Every Size online. Promotes the intake of a wide variety of nutritious foods. Encourages enjoyment of eating and appreciation of meals. Supports self-acceptance and improvement of self-esteem. Some dieters will require more guidance to follow a healthy eating diet plan. Conflicts with the generally accepted information about the potential health risks associated with maintaining a high body fat percentage. Health At Every Size is a healthy living diet designed to help you accept your body and achieve good health, regardless of your current weight. Readers are encouraged to eat healthy, while enjoying their favorite foods in moderation and becoming physically active. This program will support the development of a positive self-esteem and assist the individual to move closer toward the ideal body weight for them, however dieters with serious health concerns will probably require more guidance in order to achieve their desired outcomes.